Adrian Gonzalez (left) and Madison Daughety rehearsing a scene from "Battered." This is the fourth play written for the college by Katie Winkler, head of the college’s English department, and produced in collaboration with the college’s drama department. “Battered” merges language from Robert Browning’s 21,000-line, 130-year-old poem, “The Ring and the Book,” with a wholly contemporary story from Winkler’s pen. 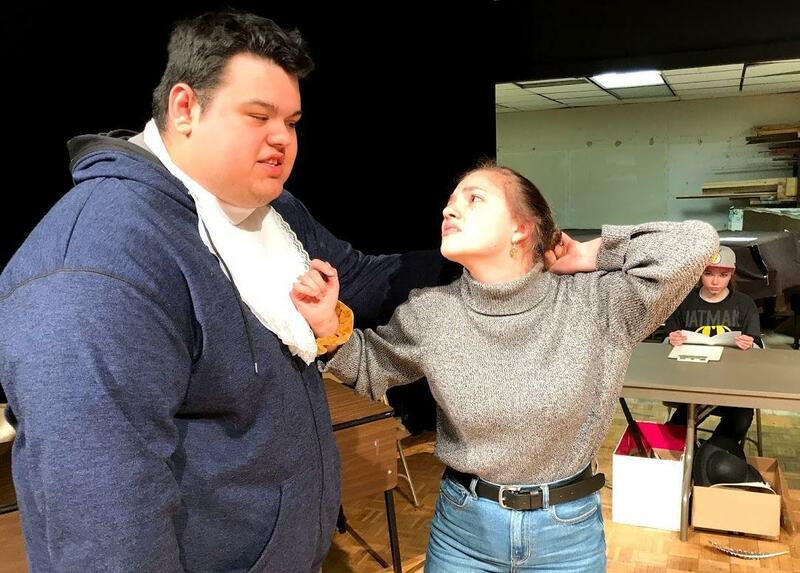 Blue Ridge Community College’s production of “Battered” is April 6 at the Transylvania County Library in Brevard and April 11-14 at the campus in Flat Rock. So with a suggestion from a writer with experience adapting books, Winkler conjured a story about a community college drama department adapting and performing a staged reading of “The Ring and the Book.” Both Browning’s poem and the new story wrapped around it carry the weight of domestic violence. For the student performers, the education runs deeper than absorbing and learning the complex script. The domestic violence within the play threads three eras: 17th Century Italy, the 19th Century lives of Browning and his wife, who experienced abuse in her family; and the present. There are also sequences produced by the college’s video production students to rekindle episodes of abuse that play out as flashbacked memories. Jennifer Treadway chairs the college’s drama department. Last year, she commissioned a new play about homelessness after helping one of her students who was dealing with homelessness. Treadway’s department now produces one show each year of what she considers important theater. Winkler said one byproduct of writing this play was the opportunity to deal with her own childhood sexual assault. “And it was painful," she said. "But this play, maybe that’s why I think it was my best. It was helping me with something, even though it wasn’t directly about that." An estimated 3.5 million Americans experience homelessness in a given year. And while downtown Asheville is the public face of our region’s homelessness, there’s an artistic effort at Blue Ridge Community College, in Hendersonville, to spotlight rural homelessness.